A beautiful piece by Swedish furniture designer Carl Malmsten. The "Berlin" design is a great 2 seater sofa perfect for bedrooms, entryways and small apartments. We have reupholstered the sofa in linen by Pierre Frey in burnt orange. perfect for mixing with patterned pillows. Kerstin Hörlin Holmquist, Big Adam Lounge for Nordiska Kompaniet, 1958, Paradiset series, Triva Collection. Newly reupholstered in off-white herringbone fabric. The Paradise collection was a mid-century hit when it came on the market for a younger audience looking to purchase furniture with a more contemporary feel at the time. A very unique piece by a female designer from Sweden inspired in the Garden of Eden. The Paradise collection is Scandinavian Modern design that reflects a transition from traditional to modern for the mid century home. Kerstin Hörlin Holmquist, Little Adam Lounge for Nordiska Kompaniet, 1958, Paradiset series, Triva Collection. Newly reupholstered in off-white herringbone fabric. The Paradise collection was a mid-century hit when it came on the market for a younger audience looking to purchase furniture with a more contemporary feel at the time. A very unique piece by a female designer from Sweden inspired in the Garden of Eden. The Paradise collection is Scandinavian Modern design that reflects a transition from traditional to modern for the mid century home. Designed by Norwegian designer Edvin Helseth as part of the Trybo series. These modular lounge chairs in addition to tables, benches, stools and other decorative elements were designed for a prefabricated cabin. The Trybo Cabin was designed with 2 intentions to be used as a vacation home or as housing in depopulated locations. The cabin was also used to promote tourism in the region of the Trysell forest in southeast Norway. The chairs are assembled by wooden dowels, extraordinary craftsmanship and design. Simplicity and quite comfortable. Excellent condition. A museum quality piece of Norwegian Folk Design. Seat height is 13.5. Hans J. Wegner is one of the masters of 20th century Danish design, producing over 200 chairs. 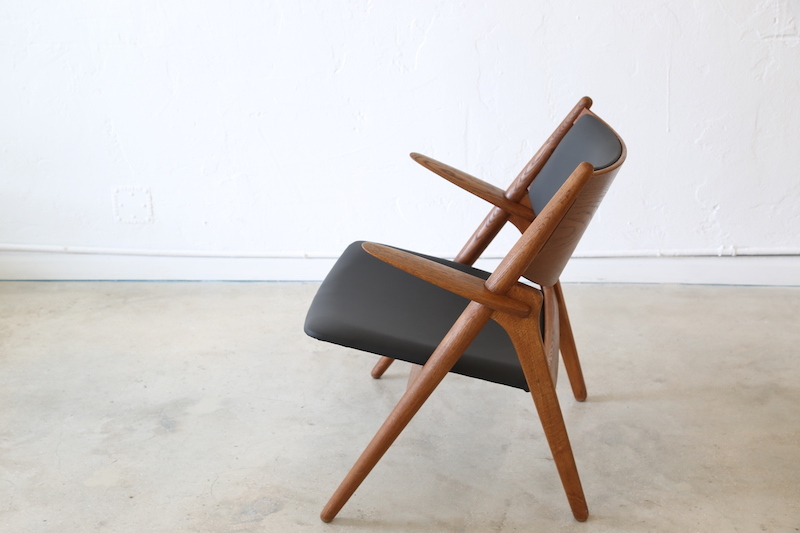 The Sawbuck Chair CH28 was designed in 1951. The tapered legs widen at the joinery and the armrests float in a Modernist style. The chair is stable and very comfortable. Leather upholstery is new, not the original. Beautiful detail in the joinery. In the design Wegner played with 2 types of wood oak and teak. The woodgrain on the oak armrests is lovely. Great stamp underneath. Seat height is 17 inches. 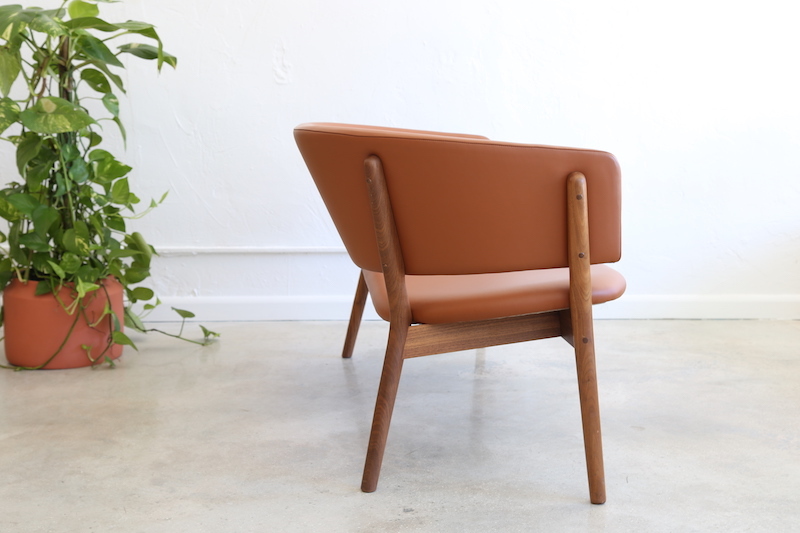 Mid-century modern Swedish armchair designed by Yngve Ekström in the 1950s and produced by Stol AB. The lounge chair has beautiful floating armrests. Imported from Sweden. Yngve Ekström was a Swedish furniture designer, woodcarver, sculptor, and architect. In the late 50s, he co-founded the furniture company Swedese. This lounge chair has been refinished, restoring to its original condition. Seat height is 14 inches. 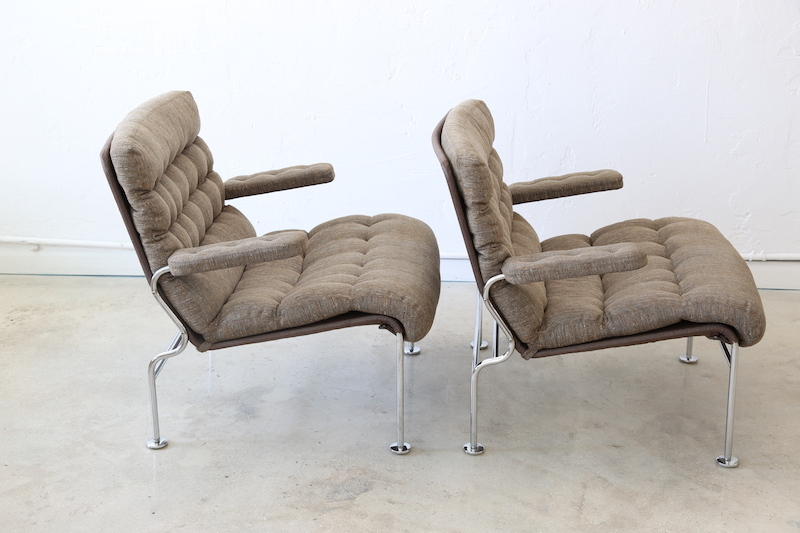 This easy-chair pair designed by Swedish designer Bruno Mathsson is in excellent condition. Original upholstery from DUX. The chrome frame is a classic example of 1960s design. A master among Scandinavian designers, Bruno Mathsson is known for his biomorphic shapes in bent wood and chrome. He was a perfectionist in both functionalism and design. Seat height 15 inches. 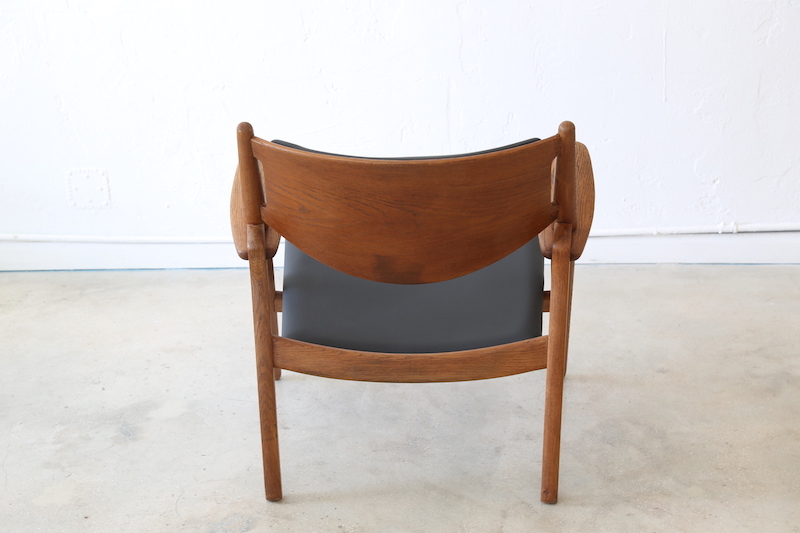 Designed in 1955 for GETAMA by Danish designer Hans Wegner. The GE 240 Cigar chair is named after its gently curved arms. The curve holds the cushion in snuggly. The original spring cushions have been reupholstered in navy blue textile. Oak frames are in great condition with original green lining on the bottom. Chairs are both marked by the manufacturer, great collectibles. Seat height is 16 inches. Beautiful pair of Skrindan armchairs by Swedish furniture designer Kerstin Hörlin-Holmquist for OPE. Designed in 1963 the pair have been newly reupholstered in the Arty fabric by Pierre Frey to give them a contemporary look. 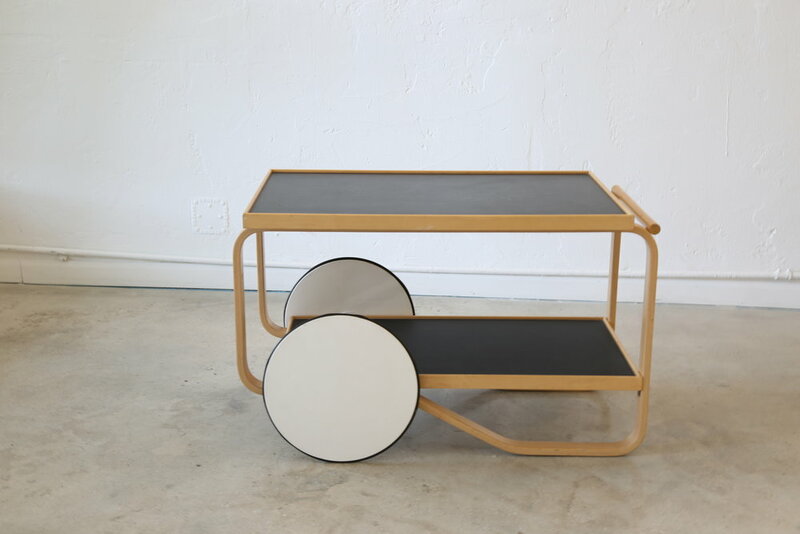 We are very excited to have this pair and other pieces by a female furniture designer whose furniture designs were popular and enjoyed by many in the mid-century in Sweden. Pierre Frey is a French family-owned textile company that was founded in 1935. Their pattern Arty is a reproduction on ivory linen of the abstract work of artist Marie-Cécile Aptel. Her colorful brushstrokes are simple, yet stunning. Seat height is 16 inches. 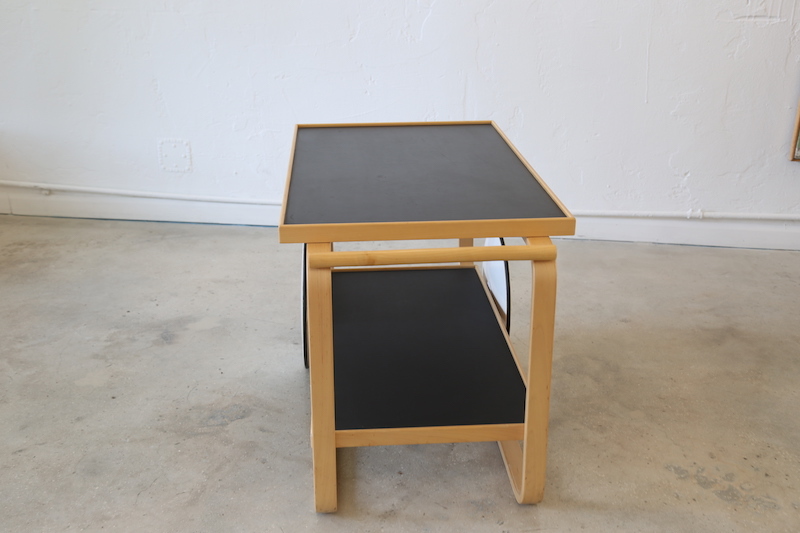 This pre-loved Alvar Aalto Tea Trolley is a modernist piece from the 30s. The Trolley was designed in 1936 by Finnish designer Alvar Aalto, who is considered as one of the founding fathers of modern design. The bentwood solution of L shaped leg is popular among all of Aalto's pieces. Not only was Aalto concerned with formal design but also in the spirit of beautiful materials and the simple forms of modernism. Aalto was a fan of artists such as Jean Arp and Brancusi. This Tea Trolley is in lovely used condition, the black laminate and the polyurethane wheel are in good condition. Great as a bar cart, side table or entryway console. Not sure the year in which this one was produced, I´m guessing 80s. Obtained directly in Helsinki from Artek 2nd cycle in Helsinki, Finland.